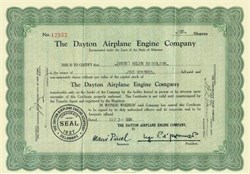 Beautifully engraved certificate from the Dayton Airplane Engine Company issued in 1929. This historic document was printed by the American Banknote Company and has an ornate border around it. This item has the printed signatures of the company’s president ( Rudolph R. Grant ) and its secretary and is over 74 years old. The Dayton Airplane Engine Co. was founded in 1927 in Dayton, Ohio. The company moved to Pawtucket, Rhode Island in 1930. The company made the air cooled engine know as the Dayton Bear (4 cylinders) and the Dayton Grant (8 cylinders).